Falcon Structures manufactures container-based buildings using our own code-compliant shipping container modules. ESR 4163 confirms that the containers we use in structures meet the strict inspection, quality and known material requirements set by the International Code Council (ICC) outlined in AC462. What does ESR 4163 mean for you, the customer? 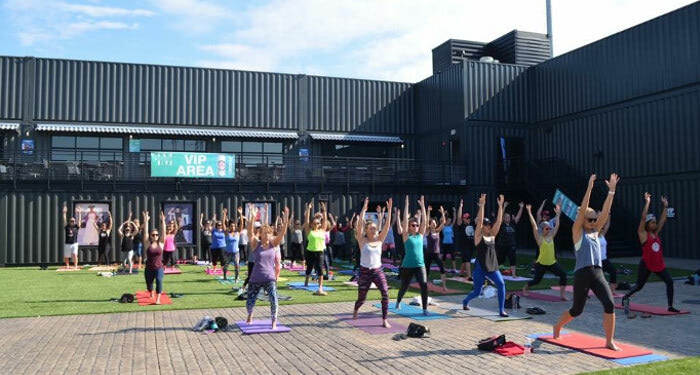 Falcon’s code-compliant shipping container modules make permitting of container-based structures for occupancy not only possible but streamlined and faster. 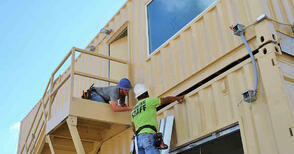 Both you and local coding officials can be confident that our shipping containers are safe and structurally sound. Why use Falcon Structures' code compliant containers? Developers, architects, engineers, general contractors and occupants of container structures need to be 100% confident the base building material used in a structure is safe, thereby passing code inspection more quickly and with less hassle. Falcon’s code-compliant containers ensure any code official can quickly and easily determine the containers used in a structure are code-compliant and therefore avoid any risk associated with approving the structural integrity of the containers themselves. Falcon’s quality control process not only ensures the container itself is code-compliant, but the processes and materials used to modify the container adhere to strict quality standards as well. We're an experienced in-house container modification company that can provide and modify code-compliant container modules. Falcon Structures is also a resource for best practices and referrals to other container structure experts. Architects have confidence that the project will not be stalled or rejected due to permitting issues. We can also offer guidance for creating structurally feasible container buildings. Falcon provides a proprietary, detailed internal design guide of container technical specifications enabling engineers to confidently design a safe structure. We've already done most of the leg work when it comes to container research. Our off-site manufacturing and on-site installation experience bolsters confidence in the timeline and execution of the overall project. 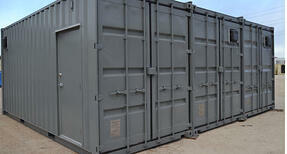 Contractors can be confident our containers will be delivered on time and on budget.